This female figure holds a large lidded bowl with the aid of kneeling female caryatids. 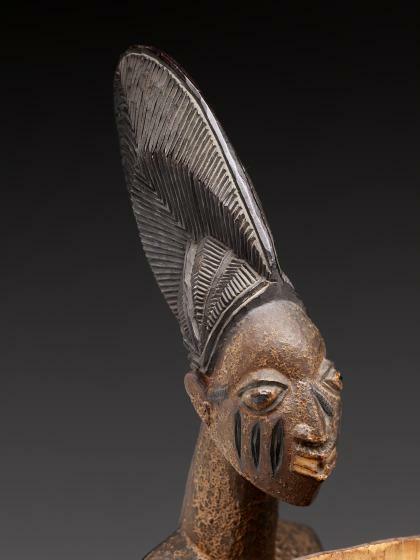 She celebrates Yoruba ideals of feminine beauty: an elaborate hairstyle, an elongated neck, lineage marks on her face, and a gap between her two front teeth. She wears waist beads like a young girl and has the dorsal scarification of an engaged woman. 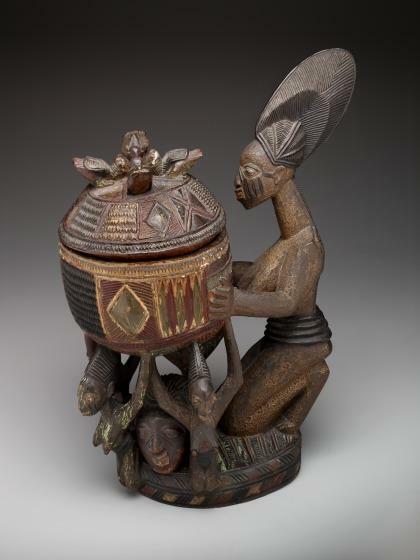 An olumeye is used to offer kola nuts to visitors or deities in a hospitality ritual. 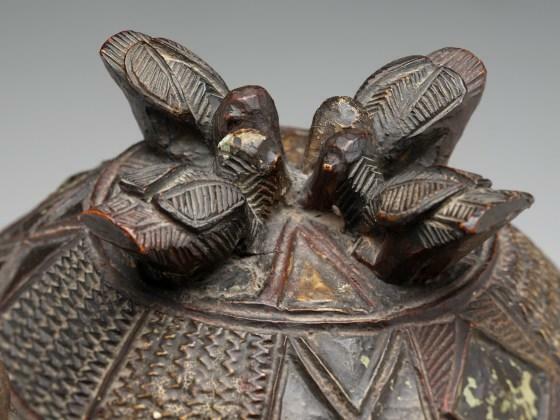 The lidded bowls of conventional examples are carved in the form of a fowl, a sacrificial animal. 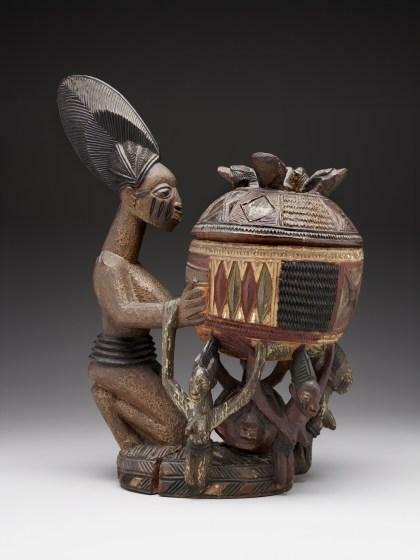 Olowe’s unique approach is to represent the Yoruba cosmos, which is often visualized as a spherical gourd divided into_ aye_ and orun, the upper and lower realms, and covered with symbolic patterns. An unusual feature of Olowe’s colorful olumeye is a free-standing human head within the “cage” of female figures, possibly representing a sacrificial victim. It is impossible to remove it from the cage. 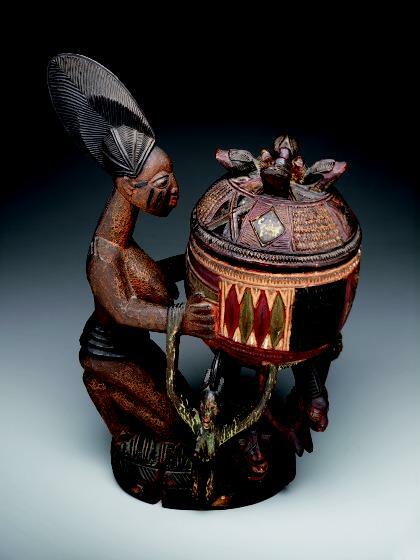 Learn about Olowe of Ise (c. 1875–1938). 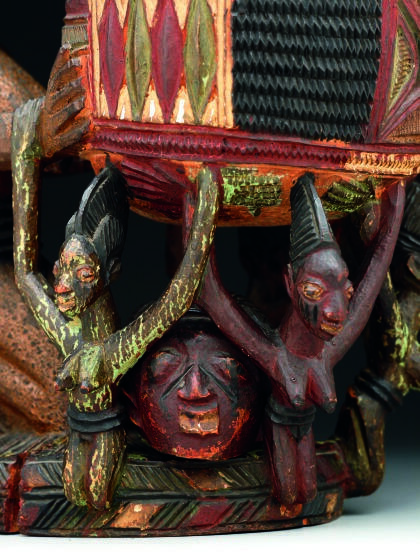 Listen to a poem about Olowe of Ise. 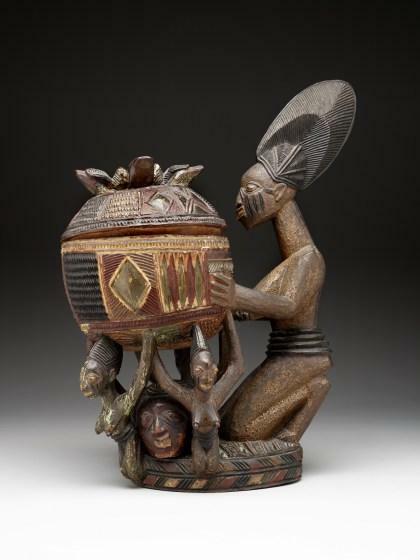 Learn about the Yoruba peoples. 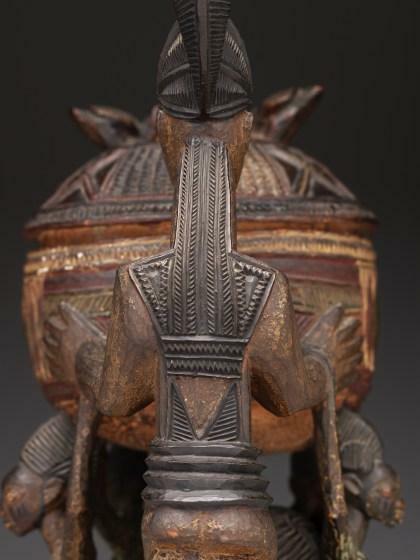 reading of and excerpt of a poem of praise for Olowe of Ise; related to DMA collection object Kneeling female figure with bowl (olumeye), 2004.16.McD; Created by Antenna?